Many organizations consider Marketing a cost center. Really? The basic definition of a cost center is any part of an organization that adds to the cost of running a company and is not directly responsible for revenue or investment decisions. Wow! Customers create revenue and Marketing’s job is to find, keep, and grow the value of customers, so clearly Marketing is an essential part of the revenue equation. How did the Marketing organization end up being lumped into the cost-center category and how should we think about marketing in today’s environment? And does it matter? Let’s answer the last question, first, yes it matters! Because cost centers are viewed as detrimental to the bottom line. As a result, there is always pressure on the cost center to maximize efficiencies and reduce costs – facing the relentless challenge of doing more with less. When the Marketing function is treated as a cost center the Marketing leadership is constantly in the budget hot seat, focused on keeping their costs in line or below budget. And when sales are down, Marketing organizations characterized as cost-centers are expected to reduce the Marketing budget further. Just the opposite of what needs to happen. Does that sound familiar? Of course marketing should stay within budget, but that really shouldn’t be its primary focus. Creating customers, the very essence of business should be our focus. Which leads us to the back half of the first question. How should we think about Marketing in today’s environment? It to recast the Marketing as a Value-Center. What It Means For Marketing To Be A Value-Center? Is Your Marketing Organization a Value Center or a Service Center? Ok, you say, that sounds good but what’s that mean? A value-center demonstrates value for the money it receives. 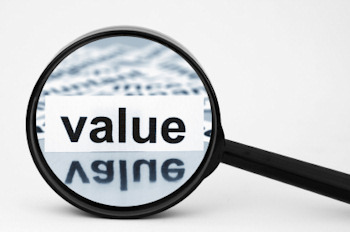 That value needs to be measured in terms of value to the business. To be perceived as a value center, an organization needs metrics that connect the function to what matters to the business. When you use measures and metrics related to activities (events produced on time and within budget) and outputs (response rate and qualified leads), the Marketing function remains a cost. To transition to a Value Center, your metrics MUST link Marketing to value, such as revenue generated from new customers for new or existing products and/or revenue generated from existing customers for current or new products. Marketing organizations that serve as Value Centers focus on improving market share, category ownership, and customer lifetime value. When you connect the work of Marketing to these outcomes, it becomes a Value Creator worthy of continued investment. Of course, you still need to show the cost side as well, but by showing the value generated, you change the perception of marketing from cost to investment. Perception is good but proof is better. And that’s why you need the right kind of Marketing dashboard. Your marketing dashboard should show the impact of your marketing investments and initiatives to the business over time and how well you are achieving investment performance targets. With the right marketing dashboard you are not managing a Marketing department – you’re managing business performance. When the leadership team begins to use the Marketing dashboard to make strategic decisions that will shape the direction of the business, Marketing has evolved from cost-center to value-center. Imagine that! Find out if your Marketing dashboard proves you are a value center.